Yoshi's Story is a stage in Super Smash Bros. Melee. It is set in Yoshi's Island, based on its look in the game Yoshi's Story. This, along with Yoshi's Island, is Yoshi's home stage—however, Yoshi's Island is not seen in action very much. It features a small island with three platforms hovering above it. There is a cloud moving below the stage which sometimes serves as a platform for falling characters. A group of Propeller Shy Guys (called simply Shy Guys in this game) fly along from time to time carrying Food. A Pak E. Derm can also be seen. 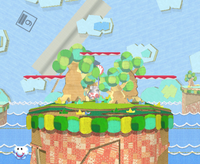 In early videos of Super Smash Bros. Melee (such as the early opening, which included some in-game footage towards the end) the stage's layout was different, with the main platform not being flat. This was altered in the final for unknown reasons. The stage reappears in Super Smash Bros. Ultimate. This page was last edited on October 26, 2018, at 17:20.